When the wastes of Qyzylqum and Karakum blossom in early spring, the enchanting sight can pain one's heart. But the killer deserts are deceptive in appearance, especially Qyzylqum, which is in the tract of land between the two great rivers in Central Asia - the Amu Darya and Sirdarya. In the spring of 1220, when Genghis Khan abruptly rode out of the Qyzylqum with a few hundred Mongol horsemen to take the Amir of Bukhara by surprise, the Amir never imagined that the desert would so easily concede safe passage to a Mongol stranger. Bukhara - one of the biggest cities at that time along with Cordoba, Cairo and Baghdad - paid heavily for the desert's treachery. Bukhara took over two centuries to recover from "God's wrath", which the austere Khan insisted he was administering to the slothful, opulent city for its sinful ways. It is again early spring in the Central Asian steppes. There is a deceptive calm, but all signs are that the Great Game is bestirring from its slumber. The United States is focusing on the key Central Asian country of Kazakhstan, which straddles the Qyzylqum and the Karakum, to stage a strategic comeback in the region. Prospects are brighter than ever as Kazakhstan is edging closer to the chairmanship of the Organization of Security and Economic Cooperation in Europe (OSCE) next year. The OSCE leadership brings Kazakhstan into the forefront of the Western strategies in Eurasia - and out of Russian orbit. The war in nearby Afghanistan provides the backdrop for the US's proactive diplomacy. But that, too, is deceptive. It seems the US is also probing a solution to the Iran nuclear problem with Kazakhstan's helping hand. The urgency is great and President Barack Obama has already hinted that he intends to pay a visit to Kazakhstan, the first ever to the steppes by an American president. According to the Wall Street Journal, the Obama administration is "carefully considering" the setting up of an international uranium fuel bank in Kazakhstan, which could form the exit strategy for the historic US-Iran standoff. That is why the visit by the Iranian President Mahmud Ahmadinejad to Astana, Kazakhstan, on Monday assumes exceptional importance. In bits and pieces, a stray thought has been surfacing in the recent months in the US discourses over the situation surrounding Iran. It sought a rethink of Washington's insistence on Iran jettisoning its pursuit of uranium enrichment as a pre-requisite of commencement of direct talks between the two countries. This was borne out of a growing realization that the US insistence was no longer tenable. A logjam has indeed developed as it became clearer by the day that within the fractious Iranian opinion there is virtual unanimity when it comes to the continuance of the country's nuclear program, and effecting a regime change in Tehran didn't necessarily alter Iran's policies. The Obama administration faces the reality that unless the impasse is broken somehow, the standoff continues. The standoff worked to Iran's advantage only insofar as the country speeded up its nuclear program ever since the series of United Nations (UN) Security Council resolutions since 2006 began forbidding Iran from enriching uranium. Iran today has installed over 5,500 centrifuges and built up a stockpile exceeding 1,000 kilograms of low-enriched uranium. It now appears that the US might cede to Iran's nuclear program. The Wall Street Journal reported last Friday that as part of a policy review commissioned by Obama, "diplomats are discussing whether the US will eventually have to accept Iran's insistence on carrying out the [enrichment] process, which can produce both nuclear fuel and weapons-grade material". The newspaper assessed that the Obama administration's message to Tehran is increasingly shaping up as "Don't develop a nuclear weapon" - a nuanced stance that would not rule out a deal accepting Iranian enrichment as such. It pointed out that Obama's articulations on the subject have become much less specific than those of former president George W Bush, who never minced words in crying a halt to Iran's enrichment. The new thinking is that the priority should be to win greater access for UN inspectors to the Iranian nuclear establishments, as compared with the current limited inspection regime, which has led to diminishing information regarding Iran's nuclear program. In other words, why not trust Iran to retain its enrichment activities so long as its program can be effectively verified. In this scenario, it is significant that following talks with Ahmadinejad, Kazakhstan President Nurusultan Nazarbayev chose the venue of their joint press conference on Monday in Astana to make the public offer that his country is willing to host a global nuclear fuel bank as part of a US-backed plan to put all uranium enrichment under international control. "If such a nuclear fuel bank were to be created, Kazakhstan would be ready to consider hosting it on its territory as a signatory of the nuclear non-proliferation treaty and as a country that voluntarily renounced nuclear weapons," Nazarbayev said. The veteran Kazakh statesman (who might have been the Soviet Union's prime minister but for the superpower's implosion in 1991) didn't speak out of the blue. Such impetuousness is alien to his shrewd political temperament. He knew the time has come for his proposal to be publicly voiced. It is an idea that is evidently supported by Obama. It devolves upon the creation of a global repository that would allow countries to tap into Kazakhstan's vast reserves of uranium to fuel their nuclear plants without having to develop their own enrichment capability. At any rate, Ahmadinejad also chose to publicly welcome the Kazakh proposal. "We [Iran] think that Nurusultan Nazarbayev's idea to host a nuclear fuel bank is a very good proposal," he noted. These are, of course, early days. However, Iran used to maintain at one point that it would be open to the idea of stopping sensitive uranium enrichment if a supply of nuclear fuel from abroad could be guaranteed. In the face of the Bush administration's mindless containment strategy, the Iranian stance hardened, especially as the nuclear file got transferred from the International Atomic Energy Agency to the UN Security Council, and the country began harping on its due rights to master the complete nuclear fuel cycle, including enriched uranium, for peaceful purposes. As regards the nuclear issue, two major developments are simultaneously needed. One is ending the assumption that nuclear energy is quite the same as nuclear bomb. And the other one is about disarmament by the nuclear powers in the world. This would ease [Iranian] concerns regarding these powers and also ease the global concerns. That is to say, the issue needs to be solved fundamentally ... Ever since nuclear energy got equated with [the] nuclear bomb, a monopoly developed over nuclear energy, whereas nuclear energy has beneficial uses in medicine, agriculture and industry. I wouldn't say that it was intentional to equate nuclear energy and nuclear bomb, but, considering the broadly negative fallouts of it, we cannot say that it has been totally unintentional, either. Significantly, Ahmadinejad also utilized the second press meet to make some positive references to Obama's recent overtures. "We hope Obama would manage to … establish friendly relations with other countries on equal terms. We welcome fundamental changes and are longing for them to happen … we are waiting for practical deeds and real changes … Currently, the statements are satisfactory … If fundamental changes [in US policy] occur, we ill definitely welcome them." What emerges is that Japan might also play a key role in the US-Kazakh nuclear paradigm and any resultant new opening with Iran. The news agency Agence France-Presse reported that senior Japanese diplomats with deep experience in dealing with Iran - Tatsuo Arima, special envoy on the Middle East, Toshiro Suzuki, head of the foreign ministry's Middle East and Africa department, and Akio Shirota, Japanese ambassador in Tehran - have held several days of intensive consultations in Washington with the Obama administration, including with the National Security Council in the White House. Curiously, Japan and Kazakhstan have an expanding cooperation program in the nuclear field. There is much complementarity between the two countries since Japan is the world's third-largest importer of uranium, next only to the US and France, while Kazakhstan possesses the world's second largest reserves of uranium after Australia. Japan currently imports only 1% of its uranium from Kazakhstan and hopes to increase it to 30-40% in the next decade or so. 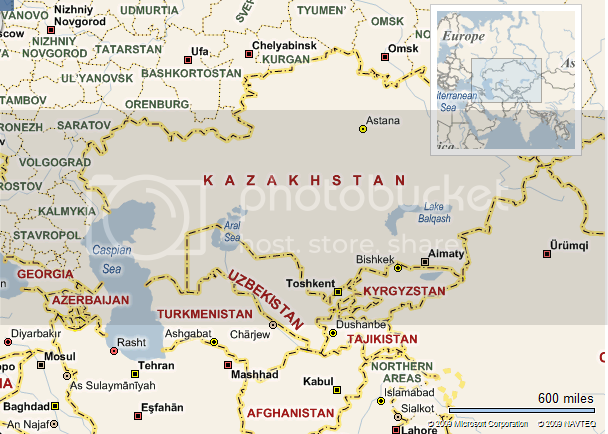 As for Kazakhstan, at 1.5 million metric tons, it holds roughly 19% of the world's total uranium deposits. More than half of the Kazakh deposits are also available for extraction by in-site leaching, which is a cheap and environmentally friendly method in comparison with extraction from open pits or deep shaft mines. Kazakhstan produced 6,637 metric tons in 2007 and 8,521 metric tons in 2008. The production is expected to jump to 11,900 tons in 2009. Japanese companies like Marubeni have moved into Kazakh uranium mines. Within the framework of a series of cooperation agreements, Japan has agreed to provide technology assistance to Kazakhstan for processing uranium fuel and building light-water reactors. One key agreement in October 2007 enabled Kazatompom, a Kazakh state company, to acquire 10% of Westinghouse Electric from Japan's Toshiba at a cost of $540 million. All in all, therefore, Kazakhstan is gearing up as a leading player in the global uranium market while Japan is eager to secure a stable supply of uranium for its growing nuclear energy industry. Japan is a notoriously reticent partner in nuclear cooperation and the fashion in which it made an exception in the case of Kazakhstan is truly extraordinary. From the US perspective, Japan would be an ideal partner for fleshing out the idea of a nuclear fuel bank in Kazakhstan since it has an advanced nuclear fuel cycle industry. Japan's Rokkasho reprocessing plant gives it a unique status as the first country to have such facility, though a non-nuclear weapon state. Japan is also committed to commercialize practical fast breeder reactor cycles. At the same time, Japan has been right in the vanguard of nuclear disarmament and non-proliferation. Washington would see that Japan fits well with Kazakhstan's ambitious plans for developing nuclear energy, increasing uranium exports, and expanding nuclear fuel production and export. Besides, Tokyo always kept up cordial ties with Tehran through the 30-year period since the 1979 Iranian revolution. More importantly, Japan rivals China in both the Central Asian and Middle Eastern regions. The rivalry provides Tokyo with just the right impetus to pay close attention to ties with Astana and Tehran, which are two key capitals in Beijing's energy diplomacy. But China won't be alone in taking stock of any US-Japanese-Kazakh tie-up in the field of nuclear energy. Russia would be equally wary of the geopolitical implications of any expansion of US influence in Kazakhstan. Russian companies have been making robust efforts to gain control over Kazakhstan's uranium mines. The Kremlin encouraged Astana to become a partner in setting up an international nuclear re-processing center in Siberia. Thus, Moscow would be displeased with any US-Japanese attempt to build up Kazakhstan as an international nuclear fuel bank. In short, Iran's support of the idea of setting up a nuclear fuel bank holds the potential to address the US-Iran nuclear standoff. On Thursday, the European Union's foreign policy advisor Javier Solana invited Iran's nuclear negotiators for talks. He wouldn't have taken the initiative without synchronizing with the Obama administration. The big question is whether Washington will shed its reluctance to engage with Ahmadinejad, who is completing his term in office in June. The indications are that Obama might be inclined to directly engage, the impact on the presidential poll in Iran notwithstanding.